For those of you who didn't know, we have started a prospect charter. Back when Rockstar gave us recognition (the article can be found here), there was a huge pile of people knocing on our doors. They wanted to join the crew, and we were overwhelmed to go over 600 applications. We can't trust everyone, but at the same time, we wanted to give everyone a chance. Eventually, the idea of a prospect crew was passed last month. Today, we have over 20 members on the prospect crew, and we are glad to see the enthusiasim. Anyone can be a prospect, but it takes some effort to recieve the patch. The full process can be found here. Next gen has not had great effects on us. There is nothing to complain about in the game; it is just as trying to fit in the changes. It crushed us in half, literally. We have some people going next-gen, some people not. We have a few playing on both generation, not sure how that is going to work out). We still have to decide on weather we want to go full next gen or not. It is difficult decision to make, because if we do, we will have to let some good people go. If we don't, we won't have any leaders to control the charter on last platforms, and if we assign someone, we would not be able to monitor over that person as we won't be there to see everything. What is going to happen? We do not know yet. One thing is certain, we are taking a vote about this matter. We are already in Los Santos. We dominate it; however, we are looking forward to see it again on better screens. The release of GTA V on PS4 and Xbox One (starting today November 17, 2014) will bring with it the return of the ruthless Grave Reapers Motorcycle Club Liberty Originals (GRMCLO). We unofficialy started on Grand Theft Auto IV as two people riding their motorcycles and having fun killing other players. Soon after the release of Battlefield 3, we became a team of 5 people. 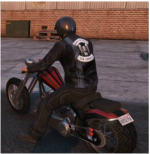 By the time Grand Theft Auto V was released, we were known as Grave Reapers MC with over 100+ members on different games and platforms. Just wanted to make a quick post as a reminder to the officer positions that we have vacant at the moment.